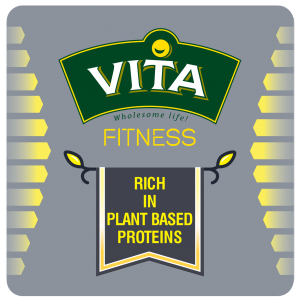 100% whole-grain Vita Fitness bread varieties contain specially selected seeds, grains and nuts rich in plant proteins, making the bread perfect for active, energetic and dynamic people. For those following a high-protein diet, this bread variety offers an opportunity to include bread in their menu again. 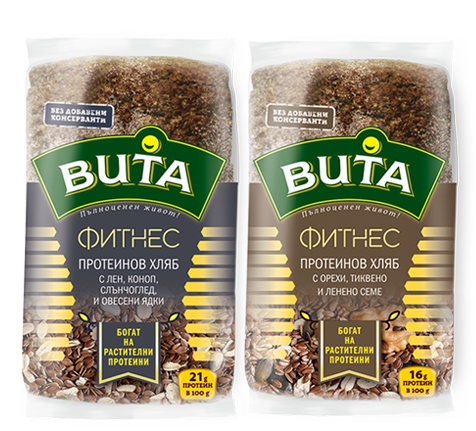 100% whole-grain bread enriched with specially selected seeds and grains rich in plant proteins. 100 g of this bread variety adds more than 20 g of protein, which makes it perfect for actively exercising, energetic and dynamic people. For those following a high-protein diet, this bread variety offers an opportunity to include bread in their menu again. 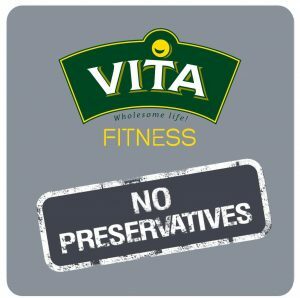 Whole-grain flour – 30% (whole-grain type 1850 wheat flour – 86%*, whole-grain type 1750 rye flour – 14%*); water; soy mix – 10% (coarsely ground soy – 40%, whole-grain wheat flour); soy protein; pea protein; brown linseed – 5%; sunflower seeds – 2%; oats – 2%; dry gluten; sea salt; bread yeast; hemp seeds – 1%; liquid malt extract; dry starter (pregelatinised wheat flour, citric acid, heat-treated wheat flour, maltodextrin); technological additives (fermented wheat flour; antioxidant: ascorbic acid; enzymes). 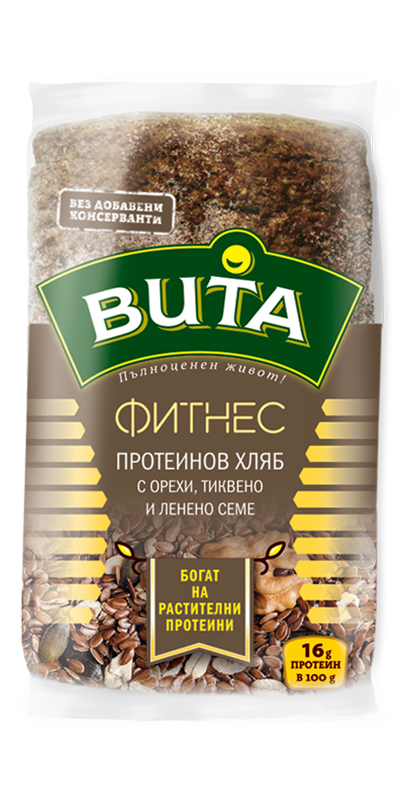 May contain traces of: sesame seeds, walnuts, milk and its derivative products. The product does not contain GMO. 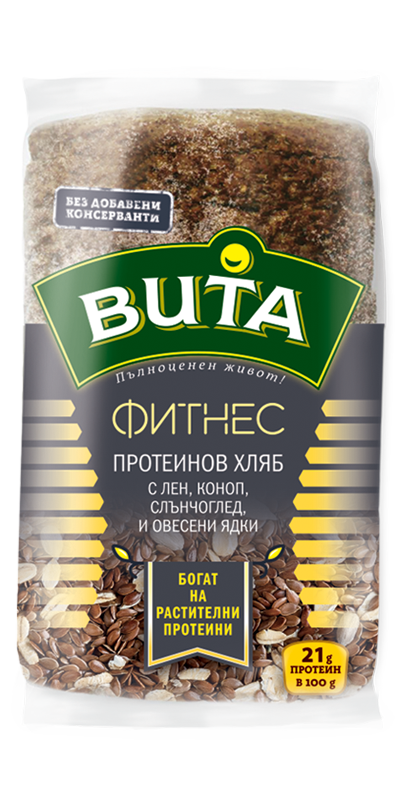 100% whole-grain bread, enriched with walnuts, pumpkin seeds and linseed, which not only add plant proteins, but also omega 3 and vitamins В, С and Е for higher tone, energy, mood and a healthy heart. 100 g of this bread variety provides more than 16 g of protein, which makes it perfect for actively exercising people and people under pressure. For those following a high-protein diet, this bread variety offers an opportunity to include bread in their menu again. 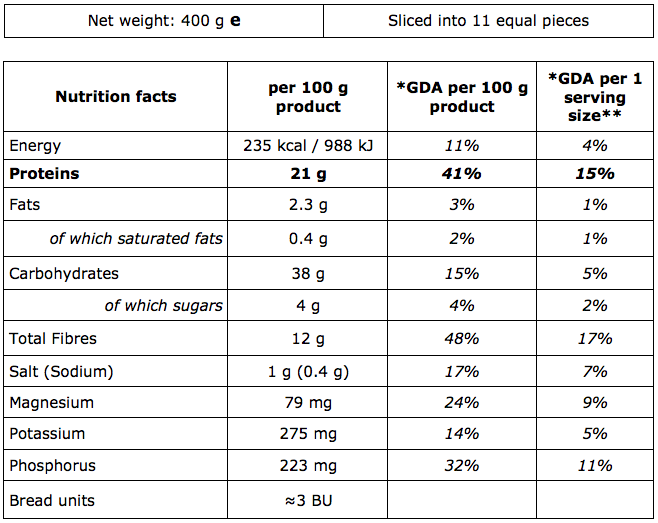 Whole-grain flour – 30% (whole-grain type 1850 wheat flour – 86%*, whole-grain type 1750 rye flour – 14%*); water; soy mix (coarsely ground soy – 40%, whole-grain wheat flour); brown linseed – 8%; soy protein; pea protein; dry gluten; pumpkin seeds – 3%; wheat bran; bread yeast; walnuts – 2%; sea salt; dry starter (pregelatinised wheat flour, citric acid, heat-treated wheat flour, maltodextrin); wheat malt flour; technological additives (fermented wheat flour; antioxidant: ascorbic acid; enzymes). 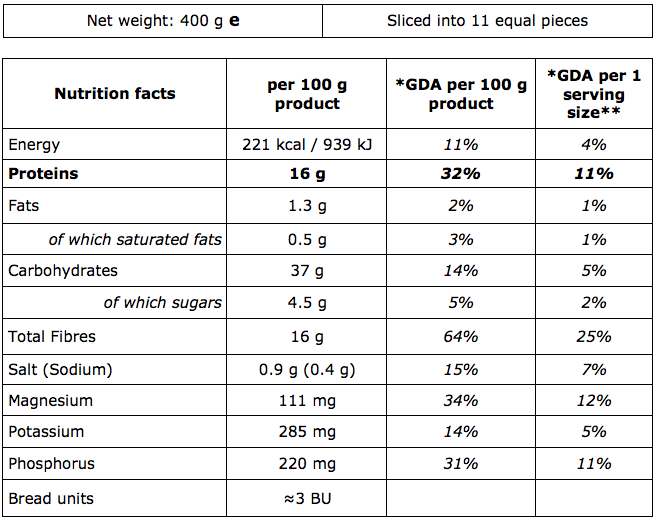 May contain traces of: sesame seeds, oats, milk and its derivative products. The product does not contain GMO.